Pipelines not only carry the crude oil we need for refining, but much of the refined product as well, such as natural gas. There are over 200,000 miles of pipelines crisscrossing our nation pumping billions of gallons of oil and natural gas to collection points such as refineries, power stations, reserve tanks, and distributions stations, as you read this. To put that into perspective, the United States Interstate Highway System stretches for just 46,726 miles. Therefore, our petroleum pipeline network is over four times longer than our interstate highway system! It is by far the largest network of its kind in the world. Continental Europe does not even come close. 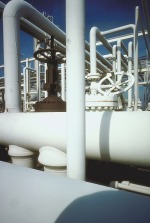 Careers in the petroleum pipeline industry are available and varied. This is no surprise given that pipelines can be found virtually everywhere across the globe, be it in cities, remote areas, near refineries, in towns, under the sea, and near electrical power plants and airports. For this reason, pipeline jobs offer potential candidates an incredible swath of terrains and climates to work in, be it offshore drilling platforms, the desert sands of the Middle East, Alaska, downtown New York City, fields in the Midwest, or in the deep southern states all along the Gulf Coast. Pipeline jobs typically come in two flavors: direct-hire and contract work. Both typically offer superb benefits and sometimes relocation packages. SCADA Engineer Jobs - SCADA Engineers are certified to work on SCADA (Supervisory Control and Data Acquisition) systems that monitor every aspect of pipeline operations. Oil Pipeline Construction Diver Jobs - Pipeline Construction Divers are professional divers who are directly involved in the construction and repair of pipelines and structures associated with the production of offshore oil and gas. Oil and Gas Pipeliner Jobs - Pipeliners perform maintenance and repair on pipelines and the infrastructure supporting them, such as storage tanks and pumping stations. Oil Pipeline Walker Jobs - Oil pipeline walkers are pipeliners who specialize in patrolling oil and natural gas pipelines and systems in order to locate leaks, washouts, breaks in joints, and damaged communication infrastructure such as downed wires and poles. Oil and Gas Pipeline Welder Jobs - Pipeline welders perform specialized (both gas and electric) welds on pipelines and gas mains in accordance with appropriate industry standards. Oil and Gas Pipelayer Jobs - Pipelayers organize sections of pipeline in preparation for welding and ensure that they are aligned accordingly. Oil and Gas Pipe Inspector Jobs - Pipe inspectors closely inspect pipe sections, steel tubing, drill pipe and other pipeline materials for defects by using magnetic and optical scanning equipment. Pipeline Supervisor Jobs - Pipeline Supervisors oversee the day-to-day operations of pipeline facility operations and ensure that they are safely operating according to industry standards and regulations. Pipeline Design Engineer Jobs - Pipeline Design Engineers are responsible for drafting project models and construction specifications related to the design and construction of oil and gas industry pipelines and infrastructure. These are just some of the positions detailed in the oil pipeline jobs section of OilJobFinder. As a member you have access to more detailed descriptions, which include pay information and educational requirements.